What are the most popular online bachelor's degrees offered in Tennessee? Tennessee is one of 16 states that make up the Southern Regional Education Board (SREB), an organization that works with local policymakers and school administrators to improve education across the state. Members of the SREB have access to a variety of educational resources that are funded by annual appropriations and benefit teachers and students. Through the SREB's Academic Common Market, students in Tennessee have the option to pursue a specialized field at an out-of-state college for that school's in-state tuition rate. There are more than 1,900 undergraduate and graduate programs that students can choose from. Distance learning students often have more resources at their fingertips than those who attend on-campus courses, and can take classes on their own schedule, when they're ready to fully engage in the material. A report from the University of Tennessee, Knoxville found that 65 percent of institutions that offer online courses use core faculty members to do so, meaning the majority of online students are immersed in the same curriculum, with the same teachers, as classroom students. In addition to flexible scheduling, online courses often have reduced tuition rates, making obtaining an affordable degree more possible than ever for Tennessee residents. Bryan College, located in the city of Dayton, is a Christian liberal arts college. The school’s opportunities for discounted or free tuition make it one of the most affordable online colleges in Tennessee. Both online and on-campus students who complete their bachelor’s degrees at Bryan can earn their master’s degrees at the college for free. Additionally, online undergraduates pay a discounted per-credit tuition rate compared to their on-campus peers. Bryan also offers several free student services and resources, including academic tutoring and counseling. Through Bryan’s adult degree-completion programs, students can earn online bachelor’s degrees in business administration, psychology, or criminal justice. Coursework for these programs is offered fully online through accelerated, eight-week sessions. Bryan’s bachelor’s of business administration program allows learners to specialize in leadership, health care management, or human resource management. Online students can also earn credit based on certain life experiences. To apply, prospective students must submit their academic transcripts. Founded in 1912, the University of Memphis is nationally-recognized for its academic, research, and athletic programs. The UofM educates more than 21,000 students. UofM Global is the University’s online collective of degree offerings, which offers undergraduate degrees in 24 areas of study, 20 master’s-level programs, three doctoral-level programs, and 13 graduate certificates. Areas of study include the arts, business, education, engineering, health professions, humanities, and social science. Online coursework is taught through the eCourseware learning system, which allows students to engage with their peers and professors. Free 24/7 tutoring is available. Smart Start is an innovative, three-tiered initiative designed to address the needs of adult learners returning to school and for students taking courses online for the first time. UofM is a member of the State Authorization Reciprocity Agreement. Several university-sponsored scholarships, including an adult scholarship for continuing learners, are available to online students. Engraved on Johnson's campus walls is its guiding principle and the words of Founder Ashley Johnson: “Open day and night to the poor young man who desires above every other desire, to preach the Gospel of Christ”. Ranking as one of the best online colleges in Tennessee, Johnson offers bachelor's degrees in five areas, including business administration and ministry leadership, and an online minor in intercultural studies. Johnson is a private Christian university that integrates biblical values into its arts and science curricula. Tuition rates are charged per term and depend on program of study. Johnson uses the Sakai learning management system, and students have free access to Microsoft Office 365 software. Student support services include 24/7 live chat for technology issues and online library services, including interlibrary loans. About 24% of Johnson's student population is off-campus, which represents students from 31 states and 17 countries. Tennessee Tech is governed by the Tennessee Board of Regents and is an NC-SARA member. One of the best online colleges in Tennessee, Tennessee Tech offers an online bachelor's degree in professional studies, with majors available in health administration, IT, or two other areas, as well as a degree in interdisciplinary studies, a self-designed major program. Programs are delivered in partnership with TN eCampus, which is designed specifically for working adults in the TN online college system. Over 11,300 students are enrolled across Tennessee Tech's campuses and online, with about 10% from out-of-state and 7% of the student body living overseas. Asynchronous courses are accessed through D2L Brightspace, and some but not all require proctored online exams. Online support services include 24/7 technical support, online advisement, over 100 electronic research databases and resources through the virtual library, and more. In addition to a strong academic reputation, TN Tech's athletic teams are ranked in the NCAA Division I and belong to the prestigious Ohio Valley Conference. The University of Tennessee, Knoxville is a public research institution and the state’s flagship land grant university. The school was founded in 1794 as Blount College and renamed in the 1960s upon the creation of the UT system. UT Knoxville offers over 500 programs to its diverse population of nearly 30,000 students. The university offers a fully online RN to BSN degree with start dates in the fall and spring. This program is organized into five, eight-week sessions over the course of three semesters. Applicants should already have an associate degree or a diploma in nursing, a nursing license or a nursing license in progress, and at least 63 college-level credits. In addition to the nursing program, UT Knoxville offers several distance courses in other fields. Online coursework is taught in synchronous and asynchronous formats. Distance students pay the same tuition as their on-campus peers, making UT Knoxville one of the best online schools in Tennessee. Union University offers a Christian-based liberal arts curriculum in two fully-online bachelor's degrees -- organizational leadership (BSOL) or organizational management and IT. Students can also pursue an RN-BSN completion program, Master of Education in Teaching & Learning, and Doctor of Education in School Reform. An accelerated format allows students to finish the BSOL degree and the general education requirements for the RN-BSN in 18 months. Online programs are asynchronous and designed to be flexible for working professionals. Tennessee residents are eligible for a state HOPE scholarship or non-traditional HOPE scholarship (for those age 25 and older). A virtual classroom is hosted through the Moodle learning platform. As one of the best online colleges in Tennessee, Union is the longest-running affiliate of the Tennessee Baptist Convention. A 10:1 student-to-faculty ratio allows for small class sizes and the opportunity to form closer relationships with faculty members, all of whom are experts in their field. Lincoln Memorial University is nestled in the Appalachian Mountains in the small town of Harrogate. With average class sizes of 14 students and several online learning programs and extended learning centers, the university emphasizes community and flexibility. The school’s Abraham Lincoln Institute for the Study of Leadership and Public Policy is known for its research in leadership theory and practice. LMU strives to be one of the best online schools in Tennessee by offering online bachelor’s, master’s, and doctoral programs. Among these is a fully online RN to BSN program that is designed for students who already have associate degrees or diplomas in nursing. Students in this program pay a discounted tuition that is roughly half that of on-campus classes. Freshman students with GPAs of 3.2 or higher and ACT or SAT scores of at least 19 or 910, respectively, may qualify for priority admission. Transfer students should already hold at least 12 hours of college-level credit. King's online bachelor's degree programs include a bachelor of science (BS) in health informatics, a BS in religious studies, an RN-BSN, and several other options. Major coursework can be completed in as few as 16 months with a full-time course load, and most programs require that students transfer in 45 semester hours to start. Each program requires 124 semester hours for graduation, and King offers a competitive per-semester-hour tuition rate. All programs also require a passing score on a final general education assessment. Courses are accessed through King's eLearnPortal, and students have access to a virtual library and bookstore from a core dashboard. One of the best Tennessee online colleges, King was named to the President's Higher Education Community Service Honor Roll in 2013 for its dedication and high engagement in community service and learning initiatives. King has also consistently been recognized as a military-friendly institution by G.I. Jobs magazine. The university is associated with the Presbyterian church, founded in 1867. Originally established as a junior college in 1927, UT Martin has grown to a full-scale public university where over 70% of faculty hold the highest degree in their field. In a recent survey among Tennessee public institutions, UT Martin came in first for student satisfaction. UT Martin Online delivers courses Canvas. As one of the best Tennessee online colleges, the school offers undergraduate programs in four professional areas: business management, agricultural business, interdisciplinary studies, and nursing. Qualifying students can also apply for the bachelor's completion program for veterinary technology and management, and additional online courses are available for students enrolled in legal studies or occupational licensure. Online students have access to a comprehensive set of student resources, including online tutors and access to the Math Lab and Writing Center, ask-a-librarian chat services, counseling services, and more. UT Martin's online programs are traditional four-year programs, though students may be eligible to apply non-college credit for military experience, qualifying exams, or a professional portfolio. Trevecca Nazarene's three online bachelor's degree programs include Christian ministry, management and human relations, all healthcare administration. All programs allow working adults to complete their degree in between professional and familial obligations at one of the top-ranked online colleges in Tennessee. Admitted students are assigned to a small cohort with whom they complete their program through graduation. All online learning and interaction takes place in the Blackboard virtual classroom. Located in the heart of Nashville and founded in 1901, Trevecca Nazarene is a private institution associated with the Church of Nazarene. Faculty serve as both teachers and mentors in Christian values. As a military-friendly and Yellows Ribbon-member school, Trevecca offers military scholarships for service family members and free tuition for service members will full Yellow Ribbon benefits. Online students have full access to online library services, tutoring through Smarthinking, and one-on-one career assistance services. 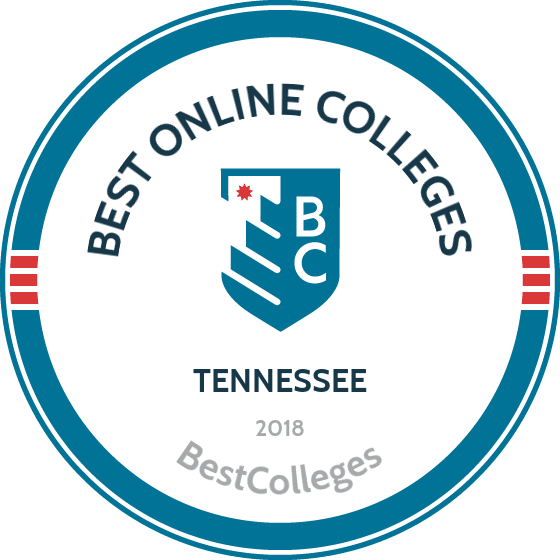 Originally founded in McLemoresville, Tennessee in 1842, Bethel is now considered one of the best online colleges in Tennessee. Bethel's unique College Start program allows adults with minimal or no college experience to complete a SACSCOC-accredited bachelor's degree in two years or less. Undergraduate programs are designed for adults aged 23 or older who are high school graduates and have at least three years of work experience. Students with at least 30 college credits can choose additional majors like emergency services management or organizational leadership. Credit hours can be earned for military and professional experience, as well as through qualifying exams. Additional features of this adult-friendly program include no-cost textbooks and required technology; no entrance exam requirements; and no exams through courses. All faculty hold at least a master's degree, and several have doctorates in their field of expertise. Students have access to personal advisory, 24/7 technical support, an online library, and more. Austin Peay is one of a few online colleges in Tennessee to offer a dedicated distance education team, complete with coordinators, instructional designers, and technologists. Students can choose from a variety of bachelor's of arts/science degrees, including a nationally ranked BS in computer science & information systems, a bachelor of business administration (BBA), and a bachelor of professional studies (BPS). Several programs offer a variety of minors and allow students to hone their expertise in a specific area. Austin Peay provides tutorials for its D2L learning platform, including videos on how to use the newly added ePortfolio feature. Students have access to online advising, online proctoring services, and free peer tutoring. Courses are delivered in an asynchronous format but offer the same rigor and content as those on-campus. Notable Austin Peay alumni include (among several others) CEO of Time Warner Wayne Pace; the Honorary Mary C. Noble, the first woman to serve as chief judge of the Fayette Court Circuit; and Bob Harper, the fitness trainer on NBC's The Biggest Loser. MT State's five different bachelor degree programs offer students variety from one of the most reputable Tennessee online colleges. The BS in professional studies is available in four different concentrations -- including in health administration and organizational leadership. A BS in liberal studies from MT State offers a wide range of study areas, from agribusiness to women's studies. Online programs are suited for adults who have earned previous college credit and are looking to finish their degree. Courses are structured in an asynchronous format and delivered via the D2L learning platform. MT State's June Anderson Center for Women and Nontraditional Students offers support services and scholarship opportunities for students who have major obligations outside of the classroom. Students have access to free peer and Smarthinking tutoring, as well as Lynda.com tutorials, full library services from a distance, and more. MT State was founded in 1911 and was originally a teacher's college before adding its first BS in degree in 1925 and eventually gaining status as a Tennessee Board of Regents institution. Located in Johnson City at the foot of the Buffalo and Cherokee Mountains and bordered by Virginia and North Carolina, ETSU continues to grow its online programs and its status as one of the top-ranked online colleges in Tennessee. ETSU offers a range of 100% online undergraduate degree programs in professional and medical fields, as well as a handful in partnership with the TN eCampus. A number of hybrid programs requiring minimal on-campus coursework or meetings are also available. Unique online programs include a bachelor's in radiologic science and dental hygiene. Courses delivered through the D2L learning platform may be synchronous or asynchronous. ETSU offers scholarships for transfer, non-traditional, and out-of-state students. Students who do not receive a scholarship are eligible for a reduced tuition eRate, which is 50% of regular tuition. ETSU also participates in the Academic Common Market, which allows students from other participating institutions to enroll in an ETSU program not offered in their home state for in-state tuition rates. Tennessee Wesleyan University occupies a 40-acre campus in Athens and is home to about 1,100 students. The school also offers online and adult programs, which serve non-traditional students by letting learners take classes at their convenience. Additionally, over 90% of the student body receives scholarships through the university’s institutional aid program, making TWU one of the most affordable online schools in Tennessee. In addition to an online MBA program, TWU offers an online RN to BSN program that is open to students who already have an associate degree or a diploma in nursing. The program can be completed in as few as three semesters. However, students must attend one face-to-face orientation and advising session per semester. Students in the nursing program also receive a per-credit tuition discount. Young college students and experienced professionals alike can benefit from attending an online college. Whether you're seeking a higher income, greater expertise, or a more rewarding career, an online program can help you pursue your academic interests and professional ambitions. Today, with so many online options available, it is important for prospective distance learners to consider both their educational goals and their budget to help them find the right program. Our affordability methodology considers value-driven metrics and ranks schools that have low tuition rates, as well as proven graduation rates and employment outcomes that provide a high ROI for students. For students in Tennessee, there are plenty of opportunities to find an affordable program locally. While distance education provides more flexibility than an exclusively residential curriculum, there are still plenty of advantages to attending a local online college, including access to lower tuition prices and local scholarships. If you're considering going back to school, and are thinking about studying online, the following list of cheap accredited online colleges in Tennessee will help you start your search. Tennessee Tech is not only a leader in web-based education in the Volunteer State, it’s also one of the more affordable online colleges in Tennessee. The Cookeville institution offers a well-rounded variety of online degree options. Tennessee Tech hosts eight career-oriented, web-based programs at the undergraduate and graduate levels, none of which are in STEM fields. The school’s virtual campus focuses on education, business, nursing, and interdisciplinary studies. Online programs at Tennessee Tech follow the traditional semester calendar, and most run asynchronously. TTU partners with TNeCampus to provide access to its online coursework. Students can earn credit through prior learning assessments. Distance learners living within 250 miles of the Cookeville campus receive discounted tuition. One of the five campuses of the University of Tennessee system, UT Martin boasts six undergraduate and nine graduate degrees online, including a highly regarded MBA. Most coursework follows the traditional semester schedule, but some classes are independently paced, allowing students to enroll any time of the year. UT Martin delivers classes through the Canvas LMS. UT Martin’s transfer policy is generous, especially with credits earned at colleges in Tennessee. Out-of-state online learners enjoy substantial savings compared to their on-campus counterparts, making UT Martin one of the more affordable online universities in Tennessee. Middle Tennessee State University offered its first online programs in 1997, enrolling 53 students. Today, the Murfreesboro institution offers more than 400 courses each semester to a student body more than 8,000 strong. MTSU Online hosts 11 degrees available entirely online (seven master’s, four bachelor’s) in addition to six hybrid programs. MTSU is also home to the largest adult degree completion program in the state. Based in Nashville, Trevecca Nazarene is a private, Christian school affiliated with the Church of the Nazarene. TNU offers an array of web-based programs at the associate, bachelor’s, master’s, and doctoral levels. Business degrees dominate TNU’s offerings, particularly in management and administration. Courses run on the cohort model, and students can complete most degrees in less than two years. The university accepts most transfer credits earned at an accredited university with a D or better. Students can also earn up to 45 credits by examination. Additionally, TNU grants credit for professional experience through its prior learning assessment program. Located in Bristol, King University set up its online programs to focus on building industry-specific skillsets, particularly in business, healthcare, and IT. To that end, King hosts web-based degree programs at both undergraduate and graduate levels. The university’s online offerings also include programs in the humanities, religion, and communication. King’s coursework is flexible and user friendly, offered in accelerated sessions with multiple start dates year-round, allowing students to complete their degrees quickly. Students can transfer up to 76 credits from another accredited university toward a bachelor’s. King earns its spot among the most affordable online colleges in Tennessee by keeping tuition low and offering the same tuition for both in-state and out-of-state learners. The University of Tennessee Chattanooga offers several undergraduate and graduate programs through its virtual campus, UTC Learn Online. The school hosts six web-based degrees, which it defines as programs that deliver more than 80% of their instruction online. These courses may require an in-person orientation, minimal on-campus attendance, or occasional proctored exams. It also offers two hybrid programs, which require students to complete up to 31 credits on campus. The university’s commitment to cost-effective digital learning has made UTC one of the most affordable online colleges in Tennessee. Distance learners at UTC can access many student resources online including tutoring, advising, and career counseling, as well as the writing center and the library. The school uses the Blackboard platform. Online students pay significantly less for tuition than their on-campus counterparts. Sometimes confused with the school of the same name in Florida, Tennessee’s Johnson University is a private, Christian institution located outside of Knoxville. Johnson offers associate, bachelor’s, master’s, and doctoral degrees in business and leadership, intercultural studies, and religious fields through its virtual campus. The university roots every program in both the Bible and the arts and sciences. Johnson runs its courses asynchronously using the Sakai platform and expects students to check in regularly and complete weekly assignments. Program participants typically spend 16 hours per week per course during each seven-week session. Students must earn 75% of their credits through Johnson, and may transfer in as many as 90 credits towards an undergraduate degree. One of the most affordable of online colleges in Tennessee, Johnson’s low tuition and many scholarships help students graduate with substantially less student debt than the national average. A Christian university located in Jefferson City, Carson-Newman maintains a thriving virtual campus. The school offers undergraduate degrees in business, nursing, leadership, and independent studies; master’s in education, business, and social entrepreneurship; and a doctorate in education. Program participants earn their degrees entirely online, mentored through the process by a Student Success Advisor. Carson-Newman offers coursework asynchronously in accelerated five- and eight-week modules. Tuition for online programs is far less expensive than on-campus classes. Online students from Massachusetts and California are not eligible for admission due to legal restrictions. The university offers its transfer students a seamless credit transfer process through the Tennessee Transfer Pathway program. Cumberland University is a private institution, located in the city of Lebanon. The school offers a bachelor’s degree in nursing and master’s degrees in education, nursing, and business administration through its digital arm, CUOnline. Most classes at Cumberland follow an asynchronous schedule, allowing students the flexibility of moving at their own pace with no required login times. Three of the programs can be completed in just one year. Cumberland offers a generous credit transfer program. With its lower tuition for online students and over 90% of students receiving financial aid, Cumberland is more affordable than many other colleges in Tennessee. Union University, the oldest school affiliated with the Southern Baptist Convention, integrates its Christian foundation into all its programs, including its award-winning online offerings. The Jackson-based university hosts two bachelor’s level, degree completion programs – organizational leadership and RN-BSN – as well as five master’s level programs in nursing, education, business administration, and Christian studies. The school also offers a few doctoral programs and several hybrid programs. Union offers its courses in an asynchronous format, allowing students to study at their own pace. Coursework follows eight-week accelerated sessions, and students enjoy frequent interaction with faculty. The student to faculty ratio is a close 10:1. Tuition is the same for online and on-campus students. The University of Memphis has thrown everything into its cyber campus – literally. Every degree offered on the public school’s brick and mortar campus is also available through its online counterpart, U of M Global. This flagship of the Tennessee Board of Regents is renowned for its MBA, nursing, education, psychology, and criminal justice programs. More than 60 degree options are available. U of M conducts most classes asynchronously on the traditional semester schedule. The university offers generous transfer policies and many innovative ways in which students can earn credit, including the prior learning assessment tool and the Finish Line degree completion program. Distance learners pay slightly less than on-campus students. Online students at Austin Peay State have two options for their web-based education – APSU’s own degree programs and programs offered through TNeCampus. The public Clarksville institution hosts associate, baccalaureate, and graduate-level programs on its D2L platform and it’s also a member of the TNeCampus, which gives distance learners even more degree options. Distance learners complete all classwork online, but some courses require in-person attendance for exams. More than 10,000 students annually participate in online courses at APSU, and they even have their own nickname, "E-Govs," inspired by the school’s Governor mascot. Courses follow the traditional semester schedule, and most are offered asynchronously, though some do require specific log-on times to participate in class discussions. Online students can expect to spend a minimum of 9 hours per week on coursework for a 3 credit course. A historically black school founded in 1909, Tennessee State now offers a robust online platform to distance learners. The Nashville-based institution offers seven undergraduate and nine graduate degrees online, many of them “professional-studies” programs with concentrations in areas like IT, leadership, and administration. Nursing and urban studies are also popular programs. The school partners with the Tennessee Transfer Pathways program to make it easier for incoming students to get credit for previous college experience. TSU is also a member of the TNeCampus program, and distance learners use its portal to access their classes. Participants can complete most coursework asynchronously. Cyber students pay a discounted “e-rate” for tuition – about half of what on-campus learners pay – making TSU one of the most affordable online colleges in Tennessee. A public university located in Johnson City, ETSU has built a busy virtual campus. The school of 14,000 offers eight undergraduate degrees entirely online and sponsors eight more that are hybrid programs. While most of the school’s online offerings are in healthcare disciplines, dozens programs are available in a range of fields, including the humanities, education, communication, sports management, and nursing. ETUS schedules classes both asynchronously and in real time and color codes them to make the format clear from the outset. Online courses run concurrently with on-campus courses. Thanks to an “e-rate” that is significantly less than the traditional tuition, ETSU is one of the most affordable online colleges in Tennessee. Prospective students can enroll in a free trial course. Affiliated with the Church of God, Lee University is a private, Christian liberal arts university in Cleveland, Tennessee, committed to conservative, evangelical, Pentecostal principles both on-campus and online. The school has a growing online campus designed to serve the academic, professional, and spiritual needs of working adults. Students can select from undergraduate and graduate programs in business, liberal studies, criminal justice, and religion. Lee’s Division of Adult Learning offers two formats – online and hybrid intensive. The former are fully online degrees earned from home, asynchronously, in seven-week terms. The latter are hybrid programs that combine web classes with two weekend residencies. Lee offers a 50% ministry discount to online students enrolled in its various ministerial programs. In 2012, a total of 21,875 students attended online programs exclusively in Tennessee. The state continues to expand its efforts to promote and better distance learning options. While tuition and fees at public, four-year Tennessee colleges have increased by 45% over the last five years, state funding for postsecondary education decreased by 6%. Such statistics have driven more college students in Tennessee to consider online programs, where tuition and fees can be less expensive. Tennessee currently has several higher education initiatives in-progress, designed to help students of all ages complete their college education and pursue lucrative employment in the state. Through its Tennessee Transfer Pathway project, for example, the Tennessee Board of Regents helps community college students transfer credits to a participating local baccalaureate program of their choice. Additionally, the Governor's Drive 55 initiative aims for 55% of Tennesseans to have a college degree or certificate by 2025. As the popularity of distance learning continues to grow, so will the number of programs and level of quality available in the state. Browse our list of the best online colleges in Tennessee for more insight into distance learning programs in this state. The Regents Online Campus Collaborative (ROCC) provides a central networking system for statewide distance learning efforts. Through the ROCC, students ranging from pre- to post-college age can access degree programs, certificates and individual courses in either fully-online or hybrid format. As the largest online consortium in the state, the ROCC provides resources from more than 40 colleges, universities and training facilities in Tennessee. Employment growth in this profession is strong in Tennessee. According to the Tennessee Department of Labor & Workforce Development, long term projections show an increase of 15% in the total number of jobs between 2014 and 2024. Wages increased by 19% from 2011-2016. What were the top careers in Tennessee in 2016 for people who had a degree in Business Administration and Management? Data source: Tennessee Department of Labor & Workforce Development, Bureau of Labor Statistics. Data may not be available for every year. Employment growth in this profession is strong in Tennessee. According to the Tennessee Department of Labor & Workforce Development, long term projections show an increase of 24% in the total number of jobs between 2014 and 2024. Wages increased by 3% from 2011-2016. In 2016, what were the top careers in Tennessee for people who had a degree in registered nursing? In Tennessee, employment growth in this profession is strong. According to the Tennessee Department of Labor & Workforce Development, long term projections show an increase of 169% in the total number of jobs between 2014 and 2024. Wages increased by 2% from 2011-2016. In Tennessee, what were the top careers in 2016 for people who had a degree in criminal justice/law enforcement administration? Employment growth in this profession is poor in Tennessee. According to the Tennessee Department of Labor & Workforce Development, long term projections show a decrease of 10% in the total number of jobs between 2014 and 2024. Wages increased by 6% from 2011-2016. In Tennessee, what were the top careers in 2016 for people who had a degree in liberal arts and sciences/liberal studies? In Tennessee, what were the top careers in 2016 for people who had a degree in general studies?